It is no secret that I think that Stanley Fischer did a good job as governor of the Bank of Israel from 2005 to 2013. He basically saved Israel from the Great Recession by essentially keeping Israeli nominal GDP “on a straight line”. 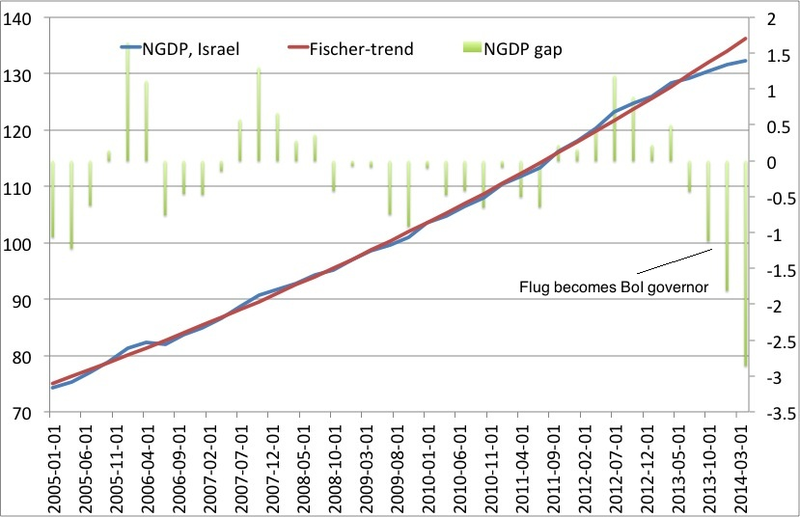 During his time in office the Israeli NGDP level diverged no more than 1-1.5% from what we could call the Fischer-trend. However, Fischer is no longer at the BoI. Instead former deputy governor Karnit Flug has taken over – effectively from July 2013 and officially from November 2013. The question then is has Mrs. Flug been able to maintain Fischer’s “straight line policy” in place? The graph below gives us the answer. The picture is pretty clear – essentially coinciding with Flug taking over as BoI governor the slowdown in NGDP growth (already started in 2012) has accelerated and we have now dropped somewhat below the Fischer-trend. It would be foolish to say that this in any way is catastrophic, but the change is nonetheless visible and should give reason for serious concern if it is allowed to continue to “drift off”. Are inflation expectations becoming un-anchored? I have earlier warned that there is a risk that we are seeing inflation expectations becoming un-anchored in for example the euro zone because policy makers are preoccupied with everything else than focusing on their nominal target (for example an inflation target). On the other hand I have also praised the Bank of Israel for always communicating in terms of (market) inflation expectations relative to the BoI’s 1-3% inflation target (range). However, one could argue that the Bank of Israel is beginning to look more like the Swedish Riksbank (which is preoccupied with household debt and property prices) or the ECB (which is preoccupied by “everything else”). A look at inflation expectations can tell us whether these fears are justified or not. The graph shows five different measures of inflation expectations. The first four are inflation expectations based on financial market pricing (BoI’s calculations) and the last one is based on a survey of professional forecasters. Most of the measures show that there has been a pretty consistent downtrend in most of the measures of inflation expectations for little more than a year. However, it is also notable that we are still within the BoI’s 1-3% inflation target range and 5-year and 10-year inflation expectations are still close to 2% and as remained fairly stable. Therefore, it is too early to say that inflation expectations have become un-anchored, but it should also be noted that we might be risking a sneaking un-anchoring of inflation expectations if policy actions is not taken to avoid it. The recent rate cuts from the Bank of Israel shows that the BoI is not completely ignorant to these risks and I believe that particularly the latest rate cut to 0.25% on August 25 is helping in curbing deflationary pressures. However, more could likely be done to insure against the deflationary risks. 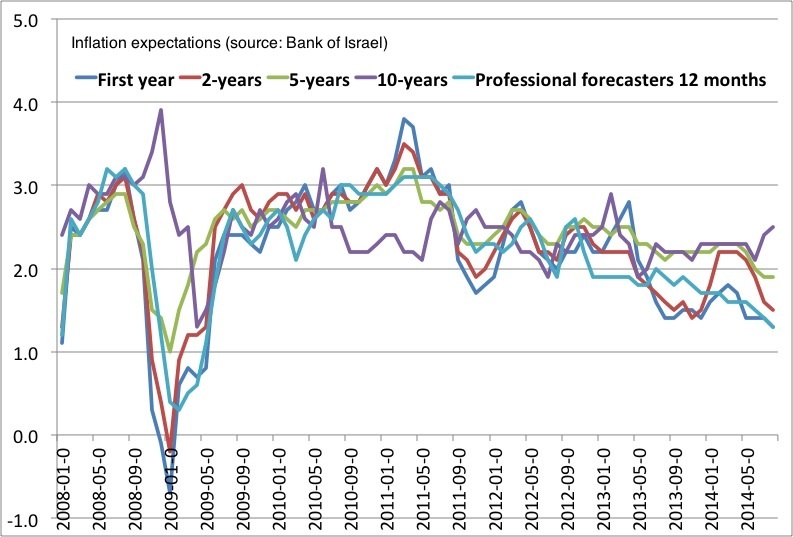 So what should Karnit Flug and her colleagues at the Bank of Israel do to bring us back to the Fischer-trend and to avoid an un-anchoring inflation expectations? That said, the Bank of Israel is far from being the Riksbank and so far the emphasis on property market developments in communication about monetary policy has not been overly problematic, but that could change in the future and if the BoI became more focused on these issues then I fear that that could led to a more fundamental un-anchoring of inflation expectations and therefore a more unstable economic development. 2) Avoid repeating the mistakes of the ECB. While the Riksbank has been preoccupied with property prices the ECB has been preoccupied with fiscal policy. There are some signs that the Bank of Israel is getting a bit too focused on fiscal policy rather than focusing on monetary policy. Hence, Mrs. Flug has recently been in a bit of war of words with Finance Minister Yair Lapid about the public budget deficit (see for example here). While I have sympathy for Mrs. Flug’s fiscal conservatism it is not really the task of any central bank to have a view on fiscal policy other than just take fiscal policy as an exogenous factor when setting policy instruments to hit the central bank’s target. The Bank of Israel should make this completely clear so market participants do not come to think that the BoI will keep monetary policy overly tight (ECB fashion) to punish the Israeli government for overly easy fiscal policy. 3) Pre-announce what to at the Zero Lower Bound. With the BoI’s key policy rates at 0.25% we are effectively at the Zero Lower Bound (ZLB). It is no secret that (Market) Monetarists like myself don’t think that the ZLB is a binding constraint on the possibility for further easing monetary policy. However, the ZLB is often a mental constraint on monetary policy makers. I think that most observers of the BoI knows that the BoI does not have major “mental” problem with using other instruments – than the interest rate – to ease monetary. Hence, the BoI has since 2008 both bond quantitative easing by buying government bonds and intervened in the currency market to weaken the Israeli shekel. It could easily do that again and I think most market participants full well knows this. Hence, in that sense Israel is in a much better than for example the euro zone. However, instead of letting the market guessing what it might do in the future if necessary the BoI should already today announce what instrument it would be using to conduct monetary policy at the ZLB. Personally I think the most suitable “instrument” to use for small open economy is the exchange rate channel either in the way it has been done for years by the Monetary Authority of Singapore (MAS) or in recent years by the Swiss and Czech central banks. I think the best option would simply be for the BoI to announce that it – if needed – could put a floor under USD/ILS and at the same time announce that it will keep the door open for moving up this floor until inflation expectations on all relevant time horizons are between 2 and 2.5%. That in my view would likely lead to a weakening of the shekel of a magnitude to bring inflation expectations immediately in line with this narrow “target” range. There is no doubt that there is a risk that Stan Fischer’s achievements as Bank of Israeli governor could be jeopardized. However, Karnit Flug has not failed yet and she still have the opportunity to continue the success of Stan Fischer. But then this has to focus on bringing back the “straight line policy” and ensuring that inflation expectations do not become un-anchored. Hence, she needs to not allow herself to be distracted by the development in property prices and fiscal policy and instead focus on how to conduct monetary policy in a transparent and efficient way at the Zero Lower Bound. PS I am well-aware that Stan Fischer no longer officially is a proponent of NGDP level targeting and that the BoI does not have an NGDP level target, but rather an inflation target. However, thing of a NGDP target as an intermediate target to implement the “ultimate” target – the inflation target. If the BoI for example keeps the NGDP level on a 5% path and we assume that potential real GDP growth is 2% then the outcome will be 2% over the cycle.